Can’t make it to Disney for a pineapple Dole whip with rum this Easter? 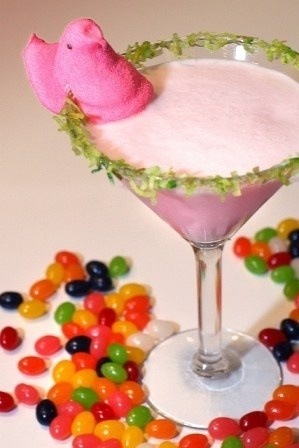 How about creating your own Easter Basket cocktail from home? Rim a martini glass with thick simple syrup and then dip into dyed green coconut flakes, then adorn with a little marshmallow peep. Think of it as your very own adult Easter Basket. Prepare the glasses ahead of time and put them on a tray decorated with jelly beans and other seasonal delights for a stunning effect. Shake with ice until chilled. Pour into decorated glasses and serve. ← Limited Time Magic Rumors!! Another All Night Party?! My mother makes an Easter cake every year. Yellow cake with crushed pineapple and white frosting in between the layers, white frosting on the outside, covered with coconut. Then she makes a little nest of green-colored coconut and decorates with jellybeans and peeps. I’m thinking I could recreate that cake as a cocktail, by using your decorations, and a pineapple upside down cake cocktail recipe. (1.5 oz cake-flavored vodka, 3 oz pineapple juice, splash grenadine or maraschino cherry juice). Thanks for the inspiration!